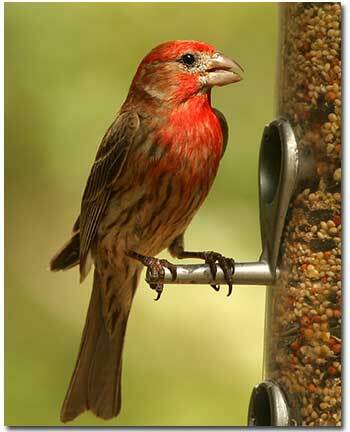 Finches, for example, come in a wide variety, are gregarious, and tend to feed in flocks. Along with the American Goldfinch (Carduelis tristi), the House Finch (Carpodacus mexicanus), the Lesser Goldfinch (Carduelis psaltria) and Lawrence’s Goldfinch (Carduelis lawrencei), there are several northern finches which irrupt into the lower U.S. when their food sources become scarce during winter; they are the Evening Grosbeaks, Pine Siskins, Common Redpolls and Purple Finches (Carpodacus purpureus). For maximum visual enjoyment, place out multiple feeders in a sunny spot, preferably sheltered from weather by a copse of trees or bushes. The latter also provides a handy hiding spot if danger threatens. Provide both food and water; finches adore niger, a black seed tiny and light that requires a special feeder such as a yellow seed sock, or a tubular hanging feeder specially designed to hold niger. Along with the above considerations when hanging your feeders, be sure to place them where you will be able to see them easily. Finches can become quite tame, and will not spook if you’re a mere two feet away, on the other side of the window, watching while they eat. These bubbly singers mix chatter with their birdsong. Scatter dove and quail food on the ground for the quail, doves, sparrows and finches that have no problem at all with feeding on the ground. Multi-tiered feeding will only enhance your delight when watching your new friends. And they do become friends, as the same birds will return to your feeders. Do not fear that yours are the only ones they visit; finches in particular follow a daily circuit of feeders and wild food patches. However, once you have begun feeding the birds, for your own satisfaction, and as a reliable food and water source, keep up with the feeding, ensuring that the feeders are kept clean and filled. It’s the least we can do for the pleasures they afford us in return.